Thank you for your letter of October twenty-eighth. I need not assure you of the pleasure with which I received any message from you or of my profound appreciation of your continued trust and friendship. 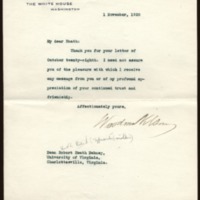 Wilson, Woodrow, 1856-1924, “Woodrow Wilson to Richard Heath Dabney,” 1920 November 1, WWP20535, University of Virginia Woodrow Wilson Letters, Woodrow Wilson Presidential Library & Museum, Staunton, Virginia.